Refurbished D7000 - May show signs of light use, Maybe with or without orignal box, 100% tested & running Netgear's latest firmware. Please Note: This is a VDSL/ADSL Modem Router, THIS WILL NOT run a VPN Client ! Enjoy the ultimate in WiFi speeds up to 1.9Gbps and a powerful dual core processor for extreme performance. High-powered amplifiers, external antennas and Beamforming+ improve range and reliability. 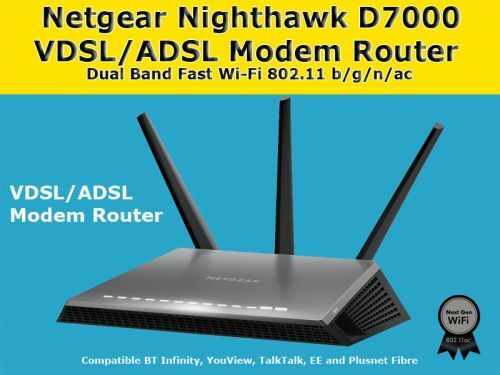 Nighthawk supports ADSL/ADSL2/ADSL2+ and VDSL/VDSL2. Using Amazon Alexa™, control your home network with voice commands. Enjoy buffer-free streaming and gaming with Nighthawk AC1900 WiFi ADSL/VDSL Modem Router. A powerful dual-core processor and WiFi speeds up to 1.9Gbps keeps you connected to speed while the advanced QoS prioritizes gaming and streaming so other connected devices won't slow you down. Features like two USB ports allows you even more convenient and quicker streaming from the router-connected USB drive.